This exciting new holiday club video consists of 5 episodes each containing a Bible story within the ongoing adventures of the desert detectives theme. The Professor and his intrepid colleague are searching for the mighty GodSword, and the suspense builds as they find artifacts and unpack the story of the Bible, and the different types of Bible literature. 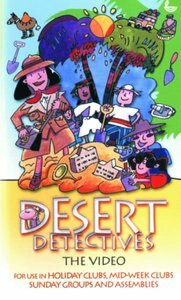 While it compliments the desert detectives program, the story line is so strong that it is also ideal for use on its own by children's workers in school clubs, assemblies and Sunday groups. It is fast moving and full of fun, and is suitable for all ages including adults.